An eventful week. I was out on family business in Denver on Tuesday and Wednesday and felt like I have been trying to play catch-up through Thursday and Friday. I’ve turned this into a blog post since it is already late Friday and I presume most of you are cruising into the weekend. But it covers a lot of ground, reflecting my efforts in the last two days trying to find a trade. Including ECB, Fed, China data, and AUD melt-down. Happy Father’s Day to you dads out there for Sunday. I think I am slipping into the lycra for a bike ride with some other local dads in the morning, and strapping my ankle and knee to play tennis (Don’t ask, getting old). I will be ready for a vino and hot-tub by Sunday night. 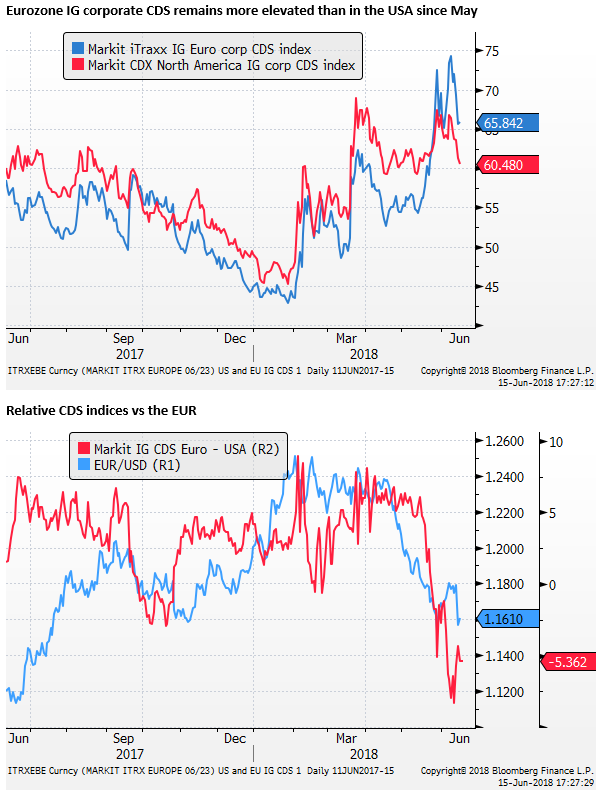 The big FX moves came after the ECB policy meeting on Thursday, although I doubt this event itself was as momentous as it seemed. It did, however, help the market adjust to all the other factors swirling around in the market. From my perspective, the Fed and ECB policy announcements were not all that big of a surprise, but there was a significant difference in the press conference delivery between the Fed’s Powell and the ECB’s Draghi. And this largely reflected the relative strength of the incoming economic reports for the two regions. 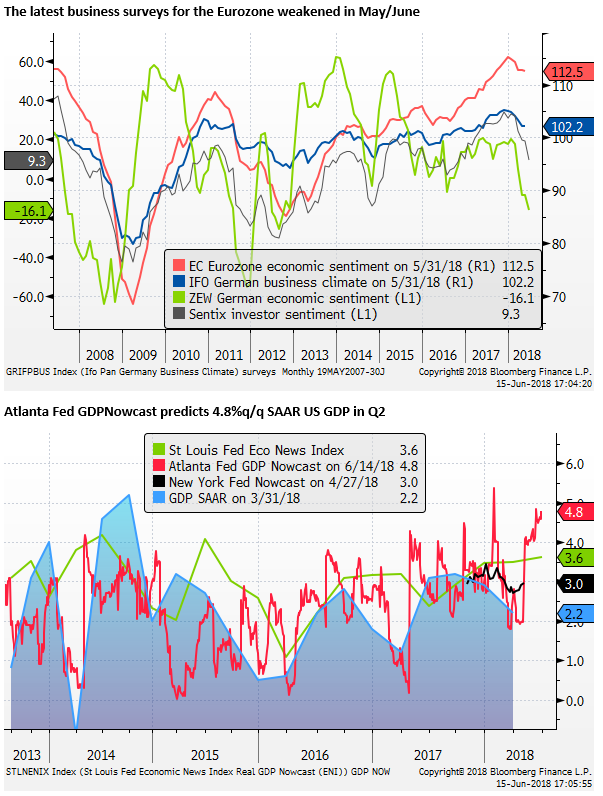 The US is experiencing a growth resurgence; the Eurozone has failed so far to rebound from its first-quarter growth set back. There are risks to the growth outlook building; Powell down-played these, Draghi sounded much more worried. During the Q&A in response to the first two reporters set of questions, Draghi re-read the risk paragraphs from the prepared text, adding there was an “undeniable” increase in uncertainty. He said the downward revision to staff growth projections this year had taken account of the softer outcome in Q1, but had not taken account more recent weak data outcomes that had come out after the cut-off date for their projections. The fall in the EUR after the ECB policy announcement probably reflected, to some extent, the more cautious answers by Draghi in the Q&A. So a combination of some weaker Eurozone data and more extended rate guidance helped push down Eurozone rate expectations. 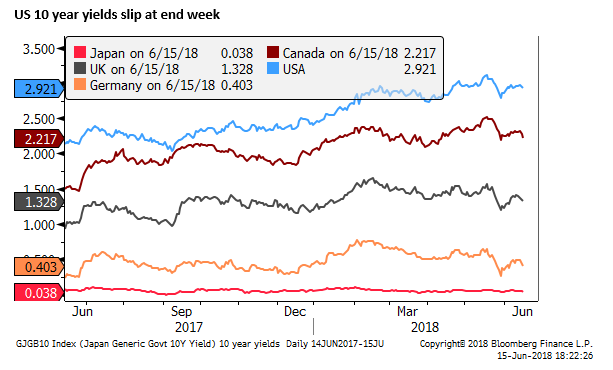 A chart we have used in this blog and other reports is to compare the rate differential between the one-year-one-year forward rate expectations. Draghi and the ECB succeeded in flattening the rate expectations for the Eurozone a year out. The Fed policy announcement helped lift these a touch in the USA. The swings in this spread have continued to help explain the EUR. In the midst of the EUR fall and retreat in Eurozone yields, we need to remind ourselves that the ECB did also announce it was ending its QE this year, after one more taper from 30bn to 15bn in Q4. One more nail in the QE coffin. Although Japan’s QE is still alive and kicking. The ECB did slightly raise its inflation forecast and expressed more confidence that it was on a path to getting inflation back to its target of just below 2% near the end of its forecast horizon in 2020. It is hard to square the greater caution Draghi expressed towards growth with the greater confidence that inflation is more likely to hit the target. It kind of tells us that the ECB has been looking for the QE exit for some time and does not see the recent growth slowdown or risks to growth as yet sufficient to put a halt to these plans. The slide in the EUR post ECB meeting was also a bit of the old ‘buy-the-rumour-sell-the-fact’ reaction. The EUR had rebounded ahead of the meeting on a speech from ECB Chief Economist Peter Praet warning that a discussion to end QE was on the agenda for this week. The EUR had also bounced back from deep fall on Italian political risk. The EUR slid after the meeting because the QE announcement was as expected, and perhaps some thought they might announce its end in September (earlier than delivered). 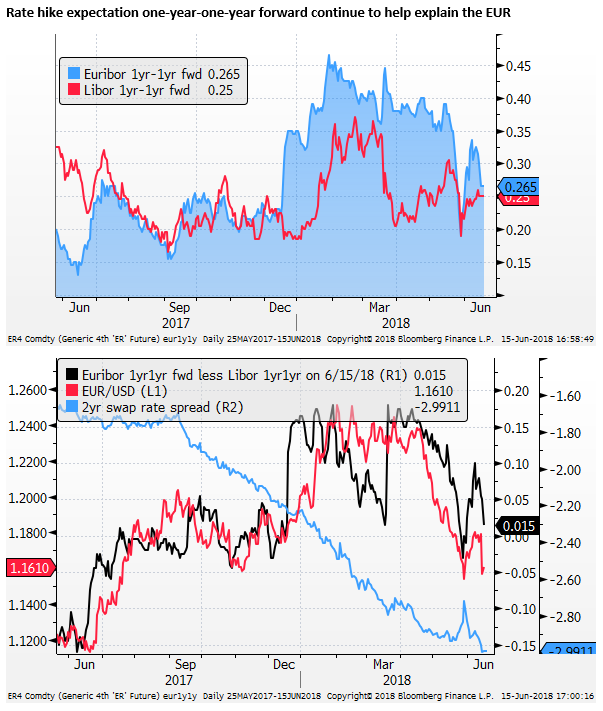 The somewhat further clarity on the rates guidance (after the 2019 summer) was a bit of a dovish surprise. 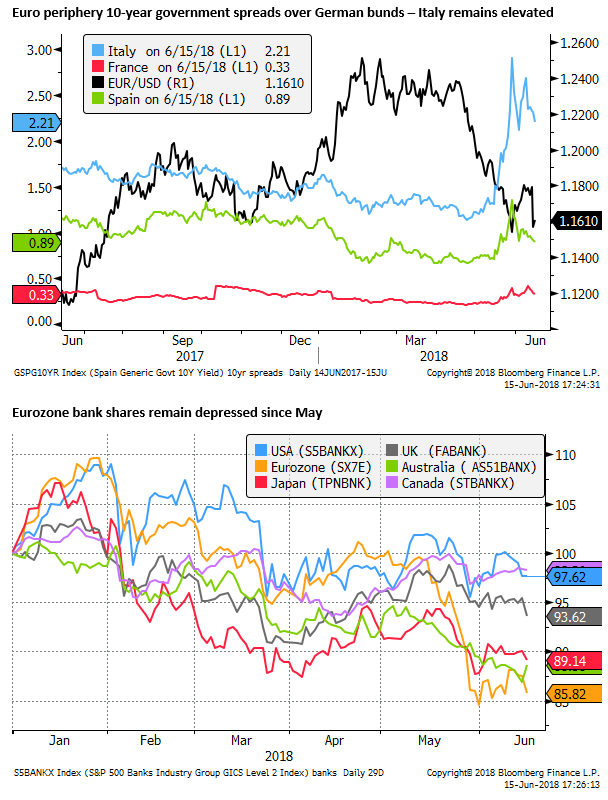 While Italian yield spreads are a bit narrower at end week, they remain elevated; as is Eurozone corporate and bank credit risk over the last month. As such this remains a factor that is working against the EUR. 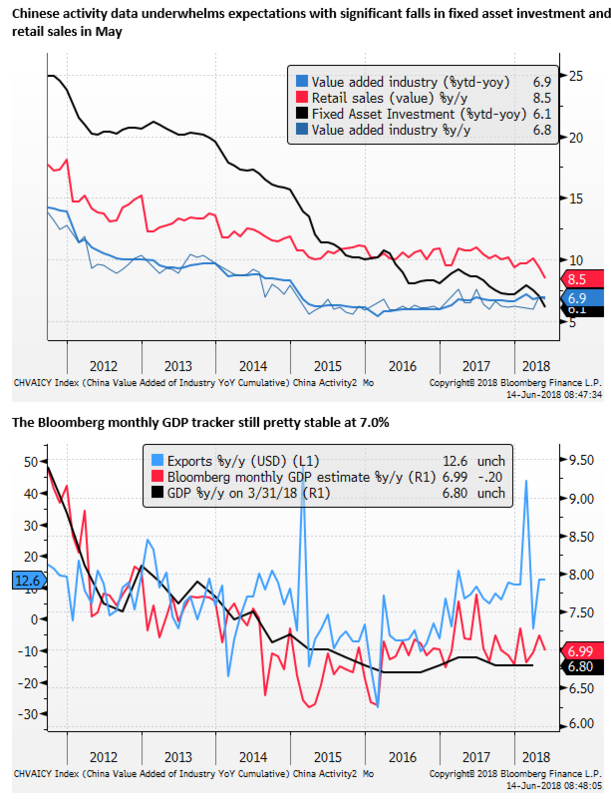 Another key development this week was the weaker than expected Chinese credit growth data followed by weaker than expected activity data. 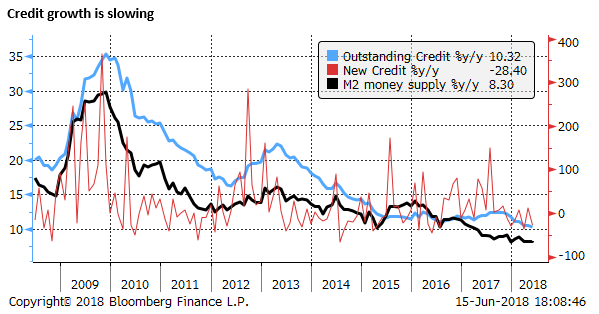 There have been a number of reports suggesting that Chinese corporates may be feeling the pinch from official efforts to squeeze out excesses in its credit markets. Chinese companies experienced in aggregate negative cash flow in the last 12 months by the largest margin ($103bn) since 2012. 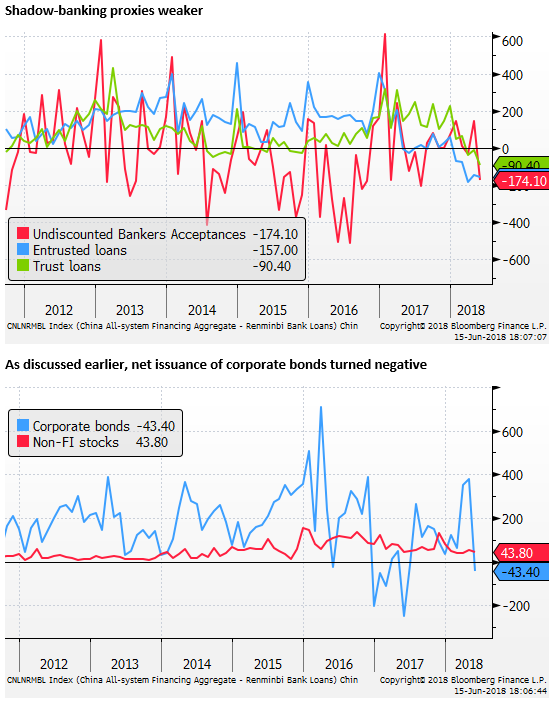 Net funds raised by corporate bond sales were negative for the first time since June last year. At least 18 domestic Chinese bonds defaulted and eight high yield trust products have delated payments this year. The average coupon on local bonds sold is at a three year high of 5.7%, up 30bp from last year. Junk-rated bond coupons are up 50bp to 6.9%. Cancellations on note sales in Q2 have hit a 2-year high. Corporate bond repayments are CNY 2tn ($313 bn) in the second half of the year, similar to the first half. 3tn of trust products are also set to mature in the second half. Hayden Brisco, Head of Fixed Income, Asia-Pacific, UBS Asset Management (I used to work with Hayden at BT in the late 90s, so I often pay attention to his media comments) said “risks are rising the further we get into this deleveraging phase”… “in the next couple of months, they will realise they've overdone it and will start to ease again through RRR cut or MLF injection.” Hayden is typically pretty upbeat when it comes to Chinese fixed income, so if he can see risks, then…. Of course, he can see China easing policy, and this might then help stabilise the growth outlook. 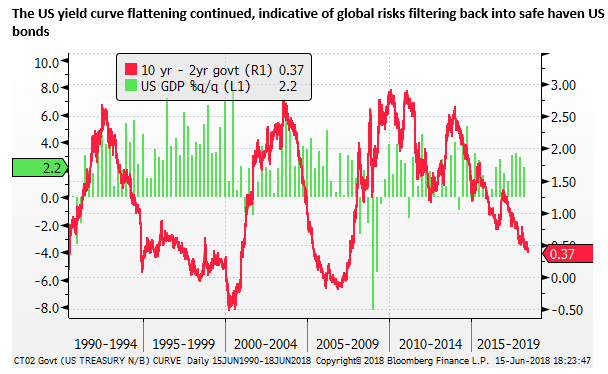 Nevertheless, it appears credit tightening in China is starting to take its toll, and this is an additional risk to the global growth outlook. This may have been a factor contributing to the sudden falls in KRW, TWD and THB on Friday. 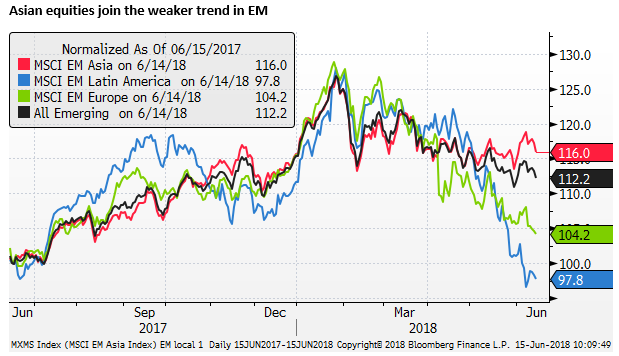 Asian currencies had been relatively stable, resisting contagion from the upheaval in Latam and European EM. However, that changed at end week with sharp falls in a number of the more stable Asian markets that are large trading partners with China. 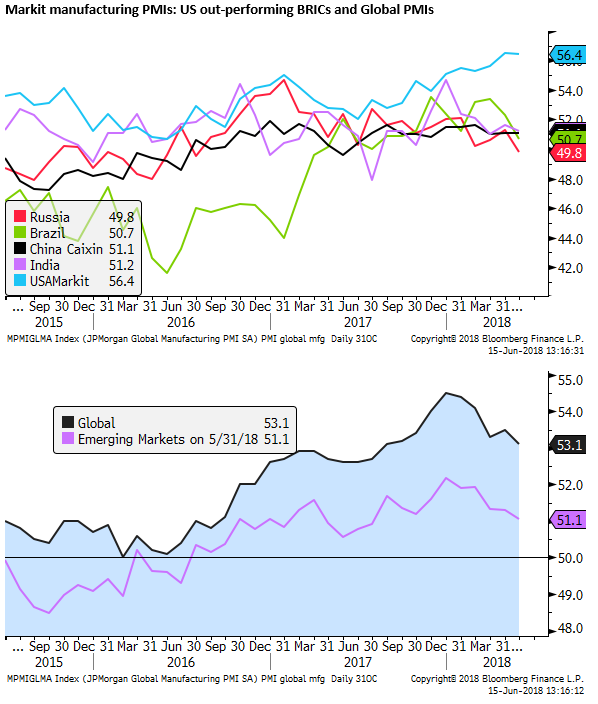 News that the US administration was moving ahead with its tariffs, and China was responding with tariffs of its own on US goods may have been a catalyst for weaker Asian currencies. 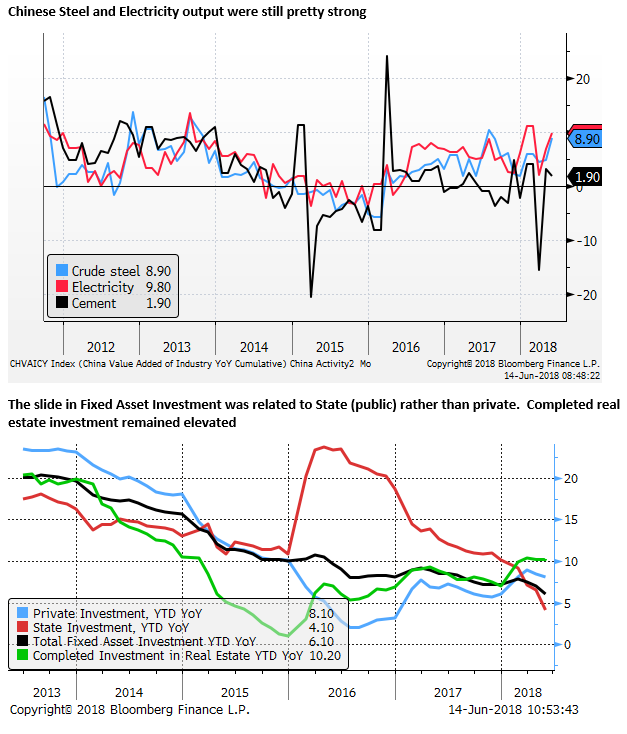 But a contributing factor may be a higher risk that credit tightening in China is becoming more severe and threatening to slow Chinese economic growth. The extension of contagion to Asia raises the stakes for global asset markets. And this started to feed into US markets at end week that have been on their own stronger tangent. The AUD has been one of the harder hit currencies. This may reflect its role as a proxy for Chinese economic and financial risk. 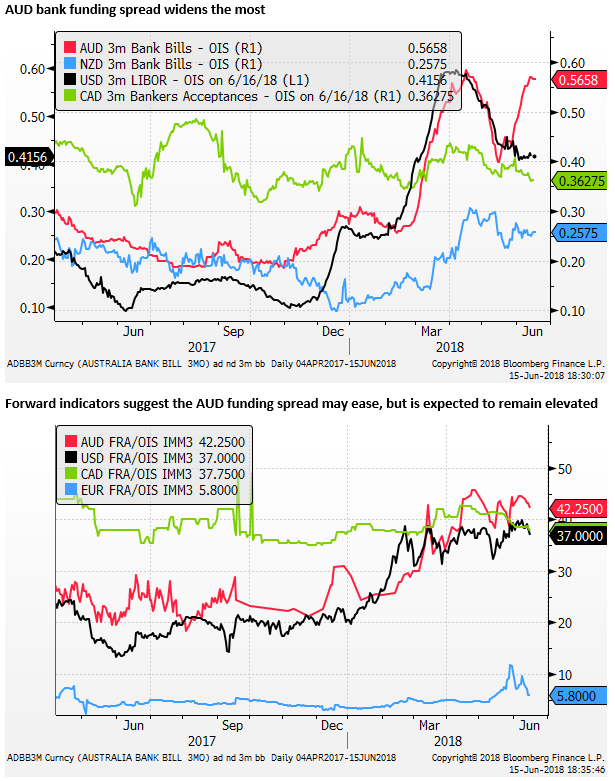 Another potential weight on the AUD is that Australian bank funding costs have increased more than most others in response to the widening US LIBOR-OIS spread. The chart below shows AUD 3mth BBSW-OIS has risen more than USD 3mth LIBOR-OIS. 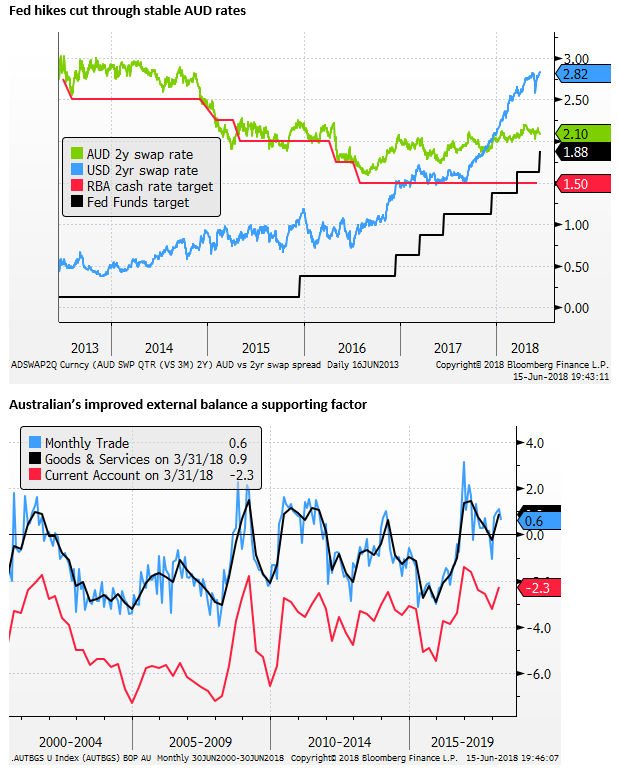 There has been no clear evidence that higher Australian bank funding costs have filtered through to higher Australian mortgage rates or tightening credit conditions. In fact, there are reports of banks lowering rates on interest-only loans after the regulator removed its restrictions on growth in this segment of credit. 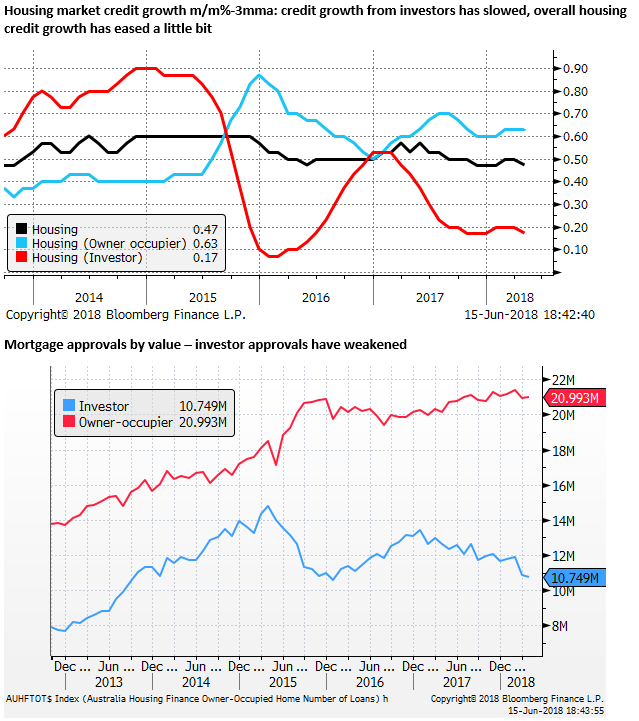 But the funding cost issue is dragging on Australian bank profitability and their equity prices, and increasing investor unease over the state of the Australian housing market. The high level of household debt is a contributing factor to the sensitivity of Australian banks to rising dollar funding costs and credit conditions abroad. If debt were not so high, banks would not be so beholden to wholesale funding markets to fund their mortgage books. The high level of household debt, banks and the state of the housing market are all intertwined to generate higher financial stability risks in Australia. Banks are well capitalized, debt is in the hands of the more well-off, and most existing homeowners have a lot of equity in their houses. As such, the authorities can claim financial stability risks are contained, and the system can cope with a significant period of decline in house prices. However, if the fall in house prices were to happen quickly, it could have more severe consequences. 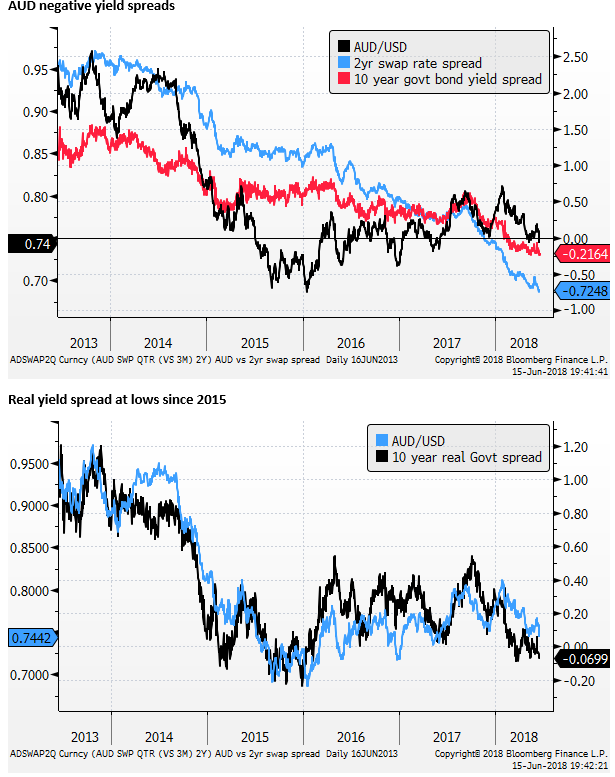 In particular, it would dampen consumer confidence and may accelerate efforts by Australians to consolidate their debt, and undermine demand in the economy. The housing market is weakening as a result of elevated prices after several years of rapid growth. Housing credit growth has slowed, in part due to regulatory pressure on banks. 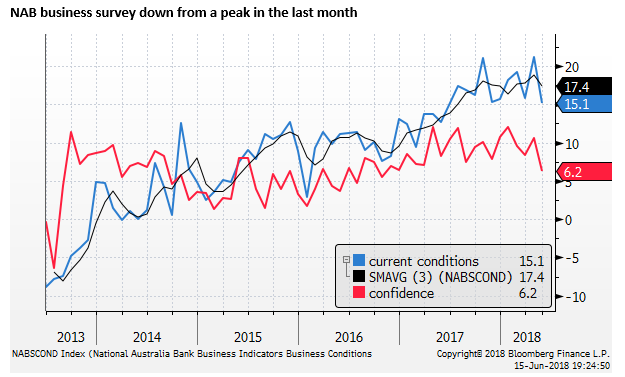 Foreign demand has eased, again in part due to regulatory pressure on banks to tighten lending conditions for foreign borrowers, tighter capital controls in China, and higher Australian sales taxes for foreigners. 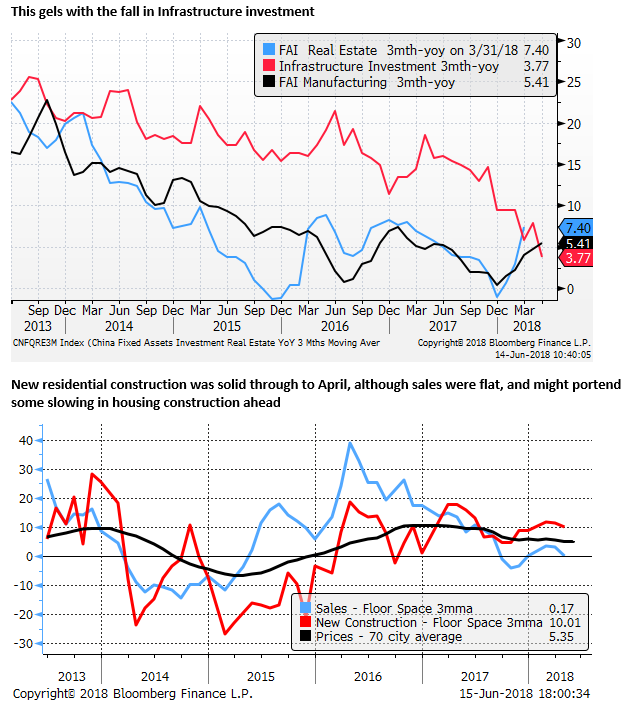 Apartment prices in major cities have fallen due to a jump in supply after a residential construction boom in recent years. A weaker housing market has not spilled over in a noticeable way to the broader economy yet. The decline has been gradual and might be regarded as a normal period of consolidation. 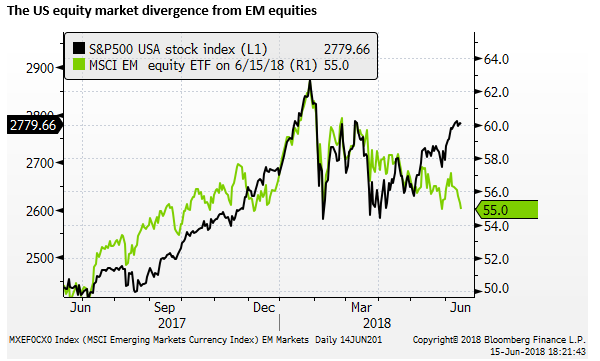 However, there are signs that it may be accelerating and a more bearish mindset is creeping into the investor market that could feed the downturn and threaten to spill over to the broader economy. The Banking Royal Commission is expected to result in further bank credit tightening. 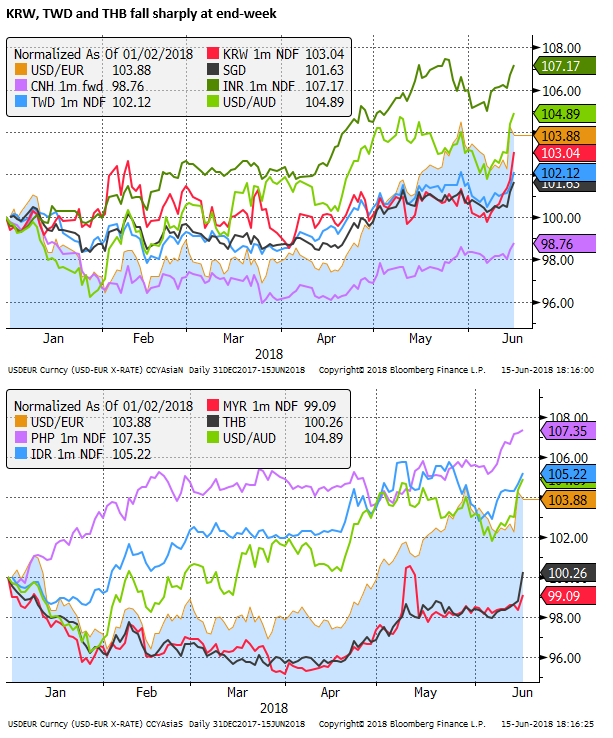 Rising interest rates in the US and widening credit spreads. Rising bank funding costs are seen as increasing the risk of tighter credit conditions and or higher mortgage rates. 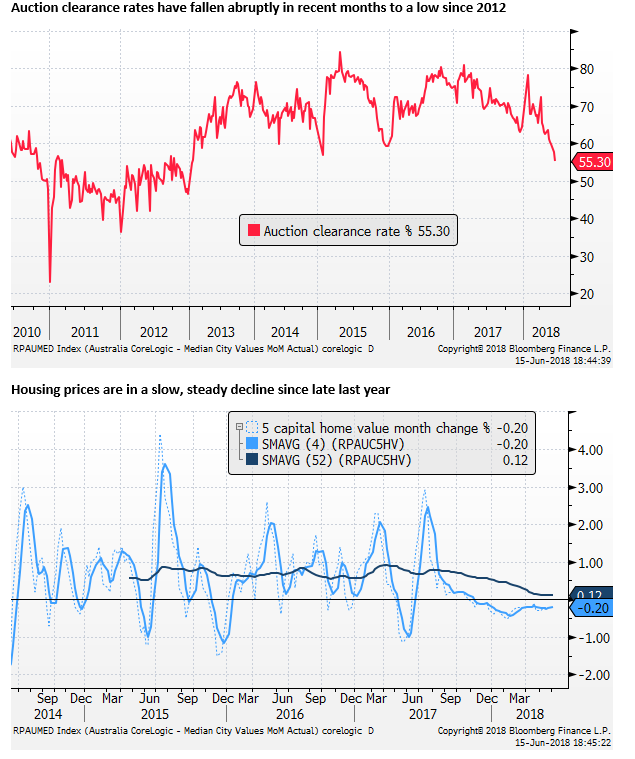 Falling auction clearance rates, weaker prices this year. A federal election is approaching, probably early next year, and the opposition Labor Party policy is to reduce tax incentives for housing investment significantly. Apart from the housing market, the Australian economy has displayed faster growth in the last year; GDP rose a strong 3.1%y/y in Q1, Household spending rose a solid 2.9%y/y, private business investment rose 5.4%y/y, and exports rose 4.6%y/y. So far household consumption has held up, supported by strong employment growth. Stronger government infrastructure spending and solid demand from high population growth and service sector exports such as education and tourism have helped support a solid, if not stellar, economic recovery in Australia. 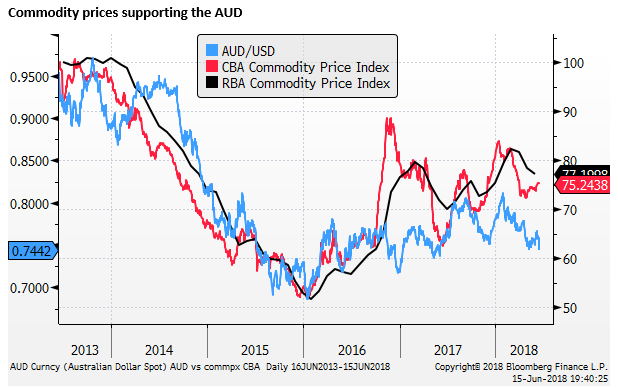 Record low interest rates are helping, there is a profit rebound in the mining sector supported by higher commodity prices, particularly for energy exports, and the mining investment bust has largely run its course. The residential building boom is over, but construction activity remains at a high level. The overall economic picture is solid, the labour market has some slack, but unemployment is falling. The RBA is predicting that the next move in rates will be higher. If it were not for the potential drag from a weaker housing market, the AUD might be quite a bit stronger. It seems it would not take many signs of peaking in activity indicators to see the AUD respond negatively. Investors appear to be in a bearish frame of mind and would be quick to assume that the risks to the outlook are coming to fruition.